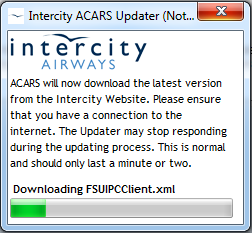 If you have any issues using Intercity ACARS, please read this document. If it does not solve your problem or answer you question, please post your query in the ACARS section of the discussion forums and we shall assist you. Microsoft Windows Vista, 7, 8 or 10. FSUIPC 3, 4, 5 or XUIPC (free or registered versions). Most users should already have these installed as they are bundled with many flight sim addons. OPTIONAL: If you wish to run ACARS remotely (i.e. not on your flight sim computer) you will also need WideFS, which is available from the same website as FSUIPC. OPTIONAL: Adobe Reader to view generated OFPs. 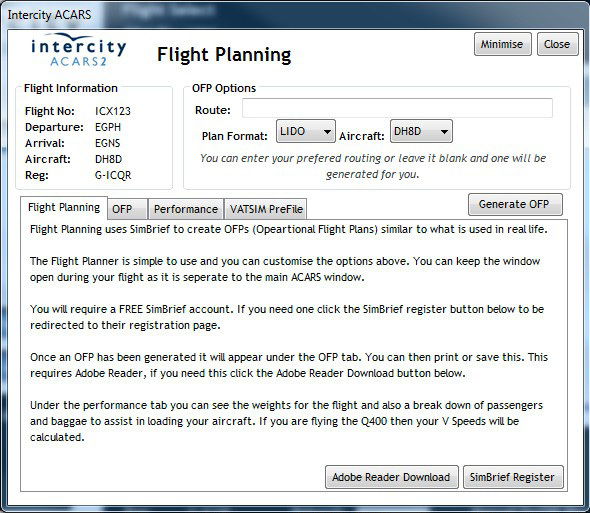 OPTIONAL: SimBrief account to generate Flight Plans (OFPs) from within ACARS. 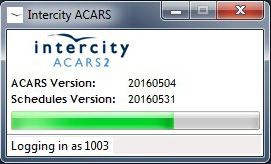 If you have just updated ACARS then a window will appear with information as to what has been updated within ACARS. 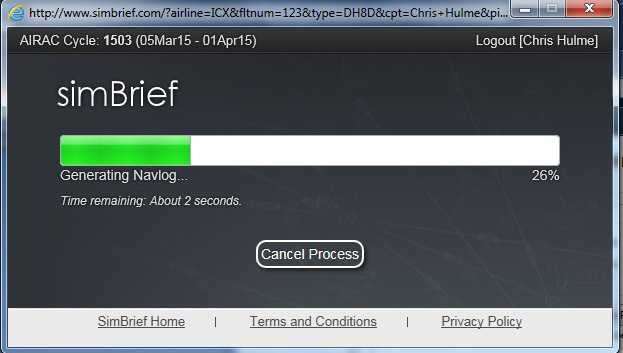 Once it has been read the message will no longer appear when loading ACARS. If you wish to read this information again, you can click "Update Info" on the Flight Select Screen. 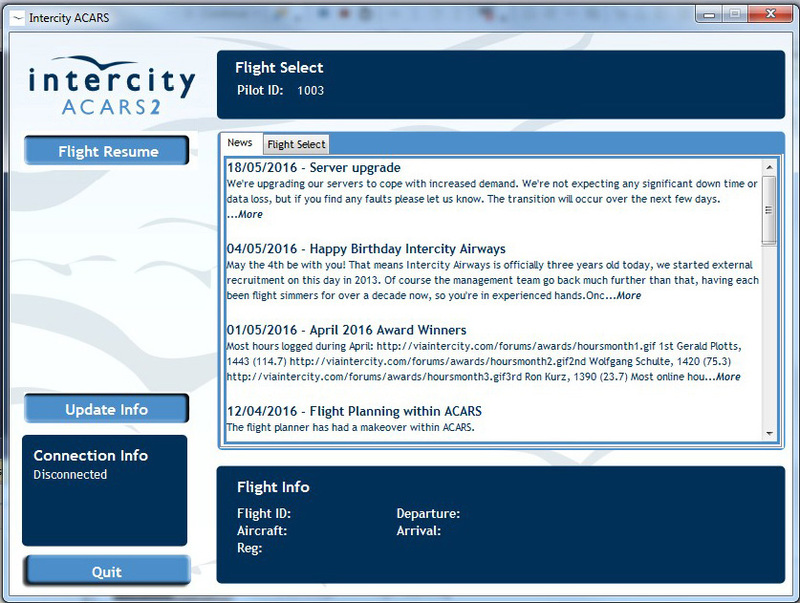 Once you have logged in successfully you will be presented with the main flight select screen. 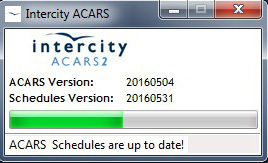 At this point ACARS will check for any incomplete flights and if any are found it will allow you resume them. Flight Resume is covered later in this manual. If you do not want to resume your previously incomplete flight, you can proceed as normal and start a new flight, although this will erase all records of your previously incomplete flight and you will no longer be able to resume it. Flight Select - Search the flight schedule and select a flight to fly. All flights in the schedule will display. You can search by using the drop down menus at the top. You can display any charters that are available by checking the charter box. Some pilots experience an issue where ACARS fails to recognise engine startup and shutdown. 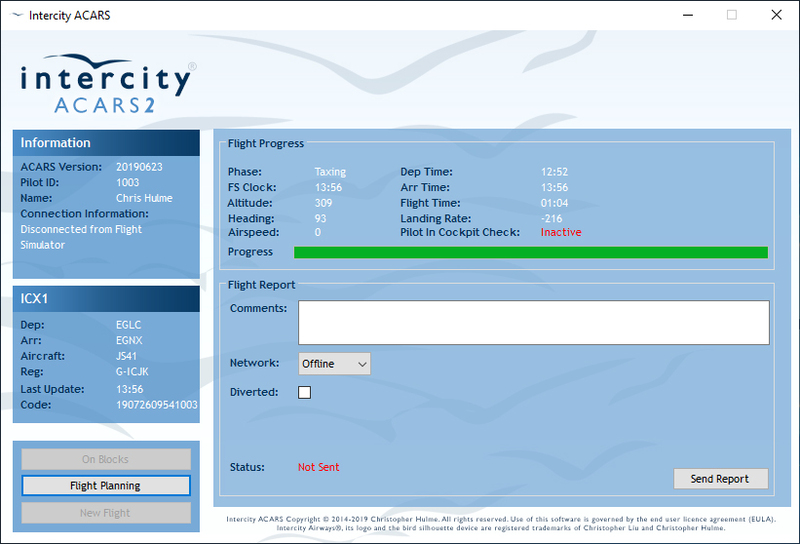 If this happens to you, you can choose to have Off and On Blocks buttons displayed on the Flight Logger screen. We recommend only using this if you have had the above issue as if not ACARS will register engine start and shutdown automatically. At this point you should start Flight Simulator and set up your flight. Make sure that you are in an Intercity Airways aircraft and are loaded on the ground at your departure airport with the parking brake set and all engines shutdown before clicking OK and continuing. After selecting a flight the Flight Planning button will appear. Clicking it will open the Flight Planning section. 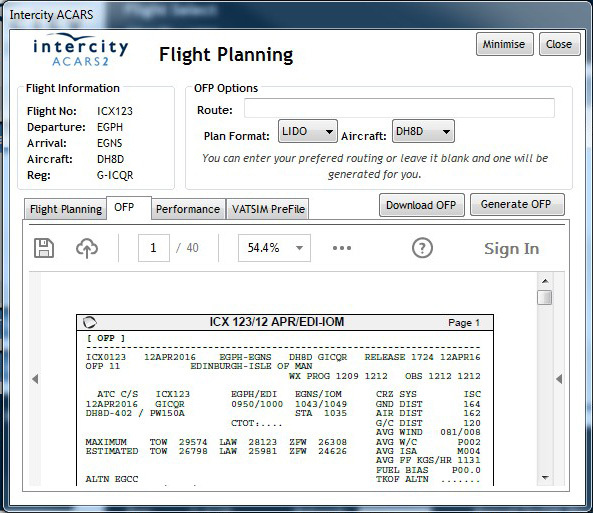 The Flight Planning window is a separate window to ACARS. This means you can keep it open whilst you fly so you can refer back to the OFP and also Performance figures. 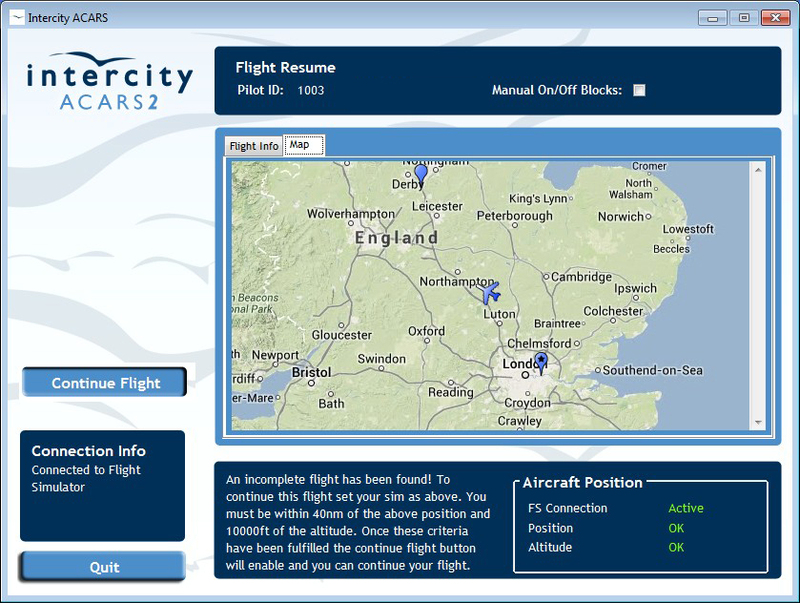 Upon loading the Flight Planning section will be pre populated with the selected flights information. If you wish to select another flight then search again and press the blue tick. This will update the flight planning section. The planner is easy to use and utilises SimBrief. 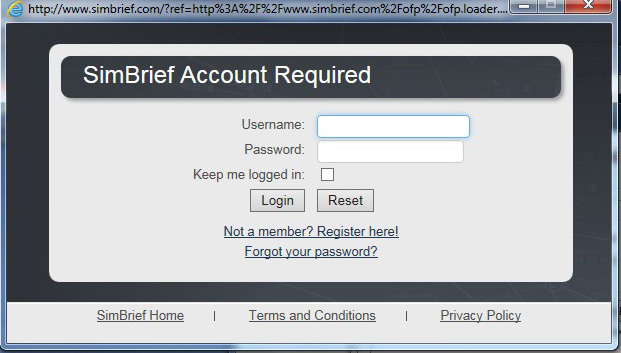 You will require a FREE SimBrief account (Register here). You can specify your routing or can leave this blank for an auto generated route. You can also select the layout you would like and if you have selected an Airbus A32S flight you can switch between A319 and A320 models. Once your happy click Generate OFP. You will be prompted to login to SimBrief, if you wish you can press "Keep me logged in" and ACARS will store you login details for future flights. 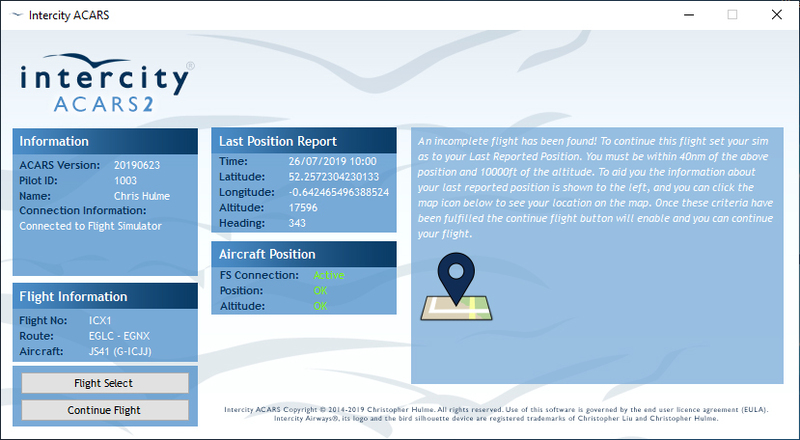 You can track SimBriefs progress and when its complete you will be presented with your flight plan under the OFP tab. If you wish to save or print the OFP can you do this directly from within the window, or you can click the Download OFP button, and it will open in Windows. 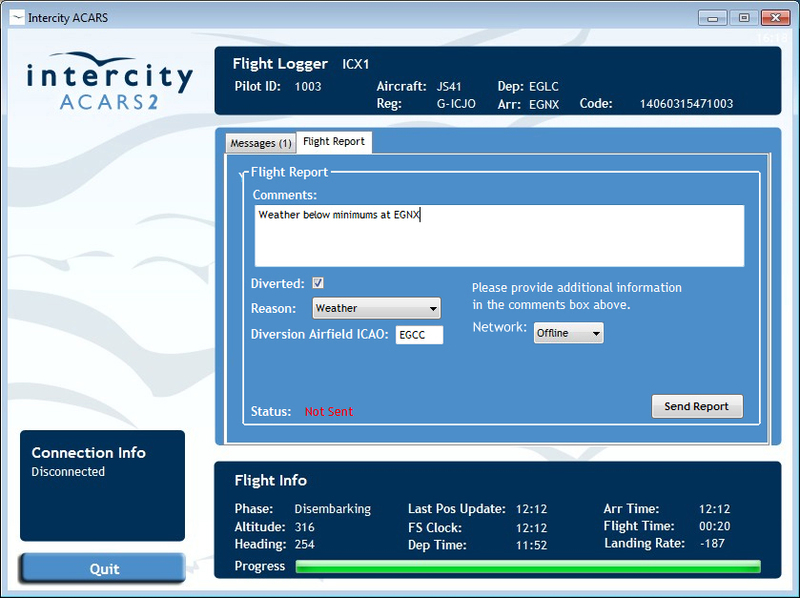 ACARS will read the OFP and extract the aircraft weights and planned fuel. 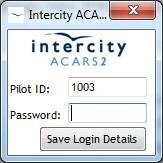 ACARS will then take this data and calculate a passenger figure and baggage figure to help you when loading your aircraft. The figures are based on the Aerosoft Airbus X, Majestic Q400 and the PMDG Jetstream 41. If you are flying the Dash 8 Q400 then your Takeoff and Landing V Speeds will be shown. These are based on the speed charts that come with the Majestic Q400, and will update according to the weights which have been extracted from the OFP. 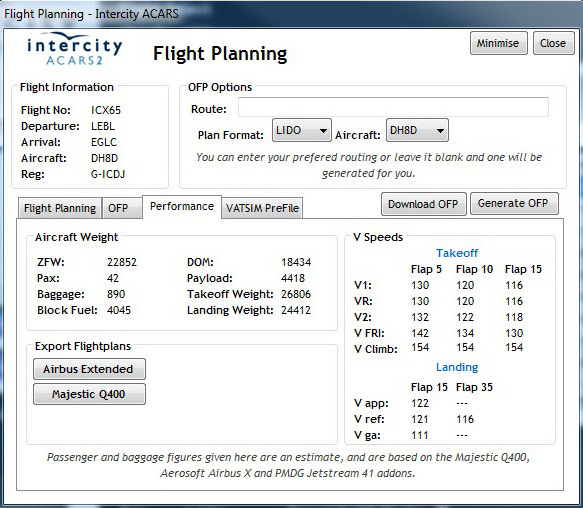 You can also export the flightplans to import into the Aerosoft Airbus X Extended and the Majestic Q400. These are saved in C:\Users\USER\Documents\Aerosoft\Airbus\FlightPlans for the Airbus and C:\Program Files (x86)\Microsoft Games\Microsoft Flight Simulator X\SimObjects\Airplanes\mjc8q400\nav\routes for the Q400. A red message will appear advising of the filename of the exported flightplan. 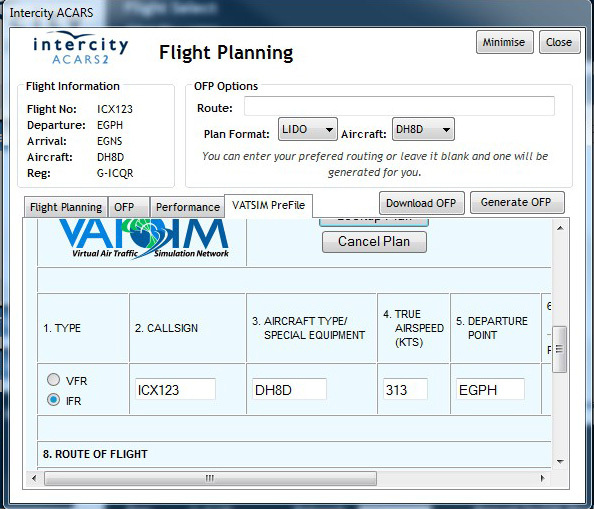 You can also file your flightplan with VATSIM, so that it can be loaded quickly from within your VATSIM Client. The form will populate, and will just require you to select your Voice Capability and enter your VATSIM CID and Password. Once the phase is set to "Boarding" you can start your flight. If you selected manual off/on blocks you will need to press the "Off Blocks" button just before you start your engines and the "On Blocks" just after you shut them down. If you didn't select manual off/on blocks then ACARS will automatically detect off/on blocks. The Pilot In Cockpit check is active liftoff to touchdown, if it detects an extended period of inactivity it will sound an alarm and you will need to press a button in the cockpit to let ACARS know you're still at the controls. To make sure that ACARS transitions through its flight "phases" you need to ensure that during cruise your vertical speed is 0 fpm for 2 seconds, which will enable ACARS to register that you have reached cruise attitude. You can track your flight in real time with a map here. 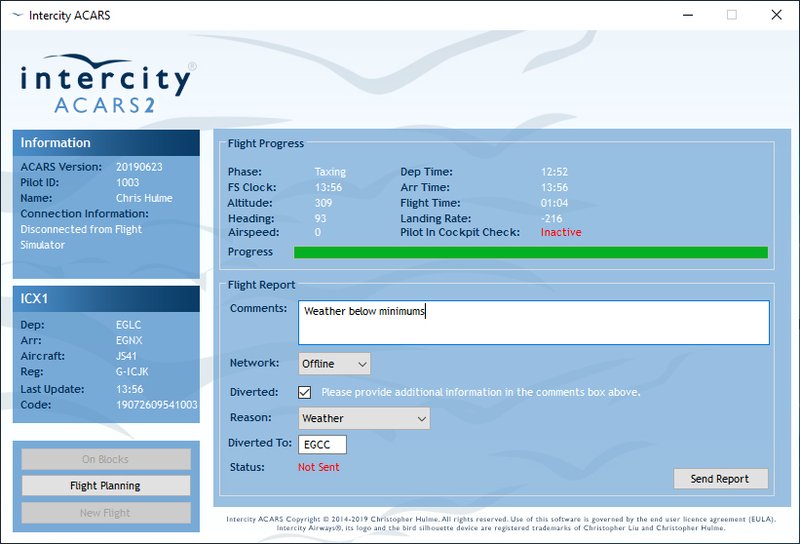 Once you have landed and shutdown your engines (or pressed the "On Blocks" button) you will then see the Flight Report tab and you can enter any comments would like to be recorded, such as your route or the weather. 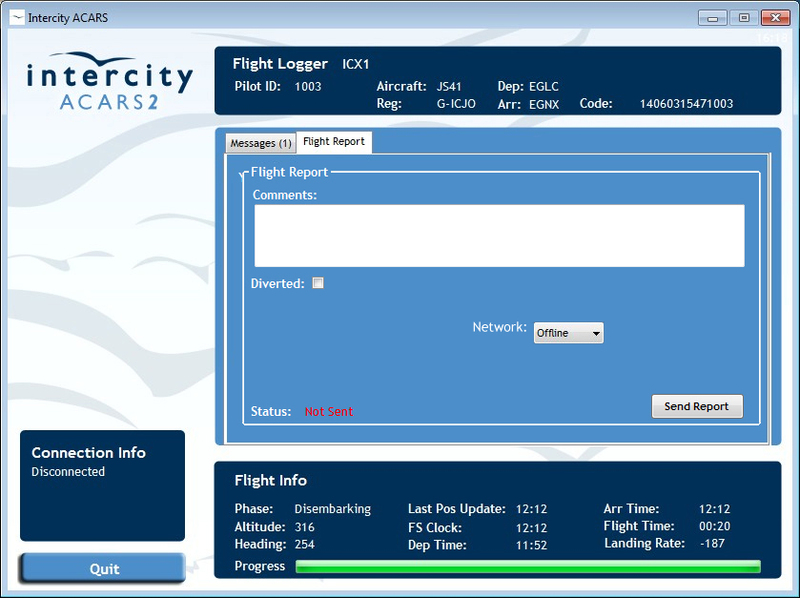 You should also select the network you have been flying on (Offline, VATSIM or IVAO) Click "Send report" which will transfer the flight log to your logbook for you to view along with a map of your route and altitude graph! In the event you have diverted to an alternate airfield you need to check the "Diverted" box. You will then need to select a reason (fuel, medical, other, technical or weather). You must also specify where you diverted to (airport ICAO code) and also provide details in the comments box. For example if diverting due to bad weather provide METARs for destination and also alternate aerodromes. If diverting for a technical issue provide details of what occurred. Please note: In reality diverts are not a common occurrence and therefore pilots who divert will have their flight report reviewed by management. NB: If you do not want to resume the incomplete flight, you can proceed as normal to select and begin a new flight, (this is covered at the start of this manual), although this will erase all records of the incomplete flight so you will not be able to resume it. 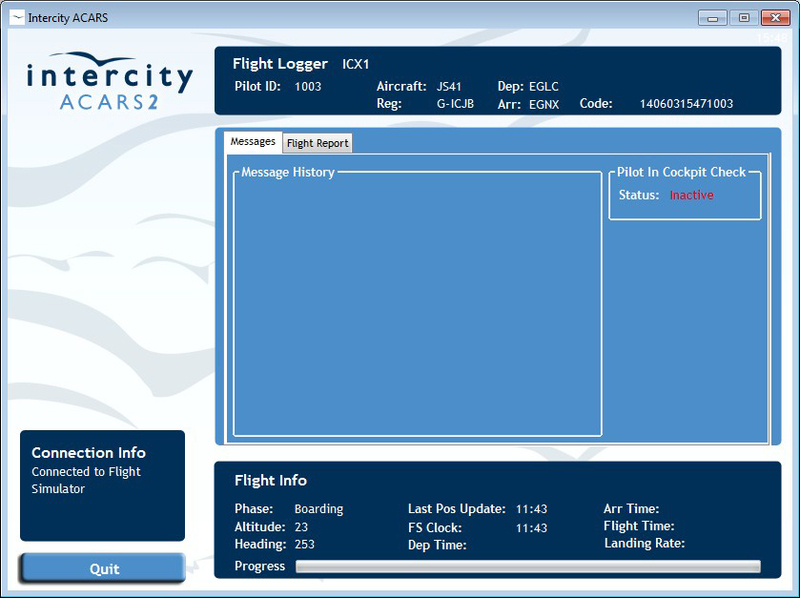 Note: Continue Flight button has been removed and flight will continue logging automatically once criteria is met. 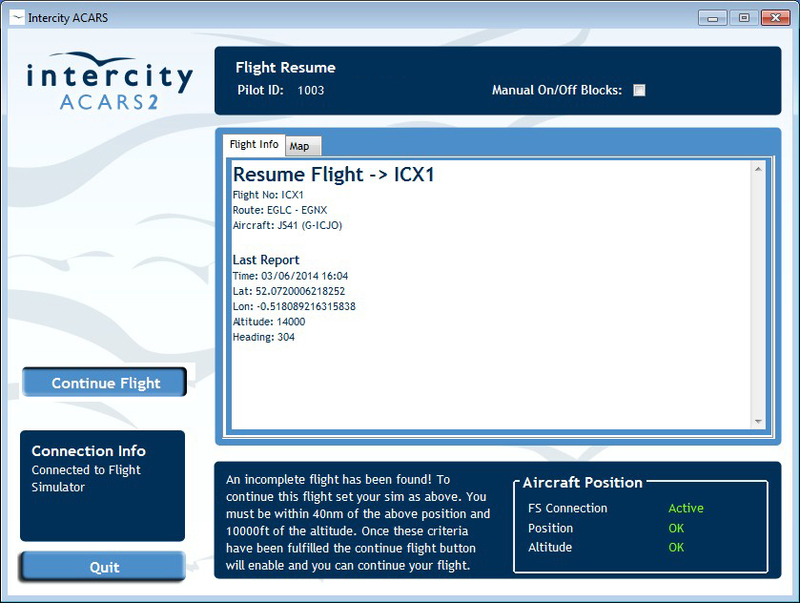 NB: The Flight Resume feature is best used in conjunction with software that will automatically save your flight at regular intervals (typically 5 minutes) such as FSX Save or a registered copy of FSUIPC.